Have all the fun of island hopping without the price tag on this guided tour from Lanzarote to Fuerteventura. Explore an aloe vera plantation, see the holy mountain of Tindaya, and visit a traditional cheese dairy where you can sample the goat cheese. 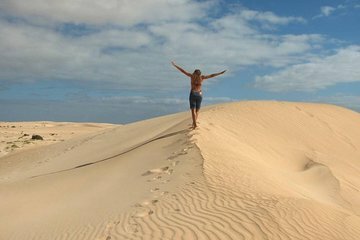 Destinations also include the old capital, Betancuria, the villages of Pajara and Antigua, and the sand dunes on the northeastern shore.